After the screening join BS Movies for a live podcast, trivia & prizes from Zia Records! Brian & Shelly are two friend and life long movie lovers who talk everything film all the time. It seemed only natural to record their ramblings and share them with the world on their podcast BS Movies! John Hughes wrote and directed this quintessential 1980s high school drama featuring the hottest young stars of the decade. 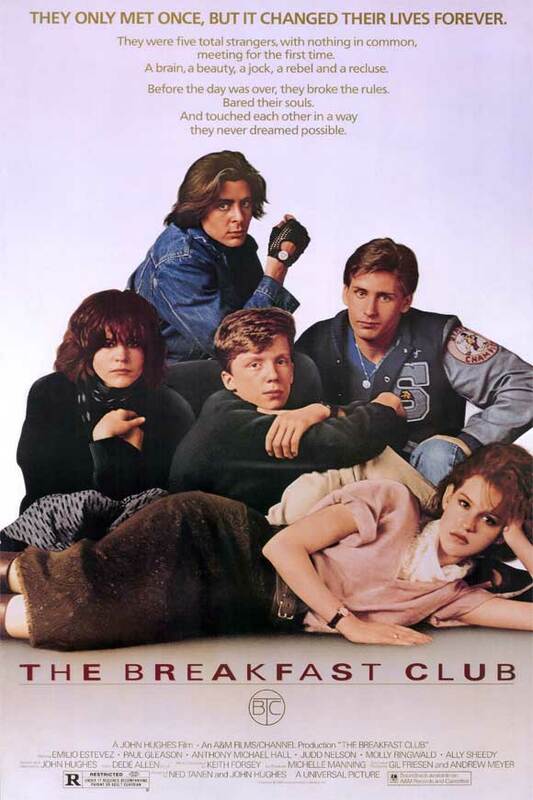 Trapped in a day-long Saturday detention in a prison-like school library are Claire, the princess (Molly Ringwald); Andrew, the jock (Emilio Estevez); John, the criminal (Judd Nelson); Brian, the brain (Anthony Michael Hall); and Allison, the basket case (Ally Sheedy). These five strangers begin the day with nothing in common, each bound to his/her place in the high school caste system. Yet the students bond together when faced with the villainous principal (Paul Gleason), and they realize that they have more in common than they may think, including a contempt for adult society. "When you grow up, your heart dies," Allison proclaims in one of the film's many scenes of soul-searching, and, judging from the adults depicted in the film, the teen audience may very well agree. Released in a decade overflowing with derivative teen films, The Breakfast Club has developed an almost cult-like status.